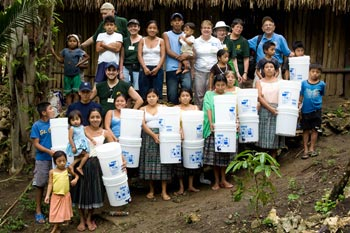 Rotary service teams have been coming to Guatemala to help improve Ak’ Tenamit’s infrastructure for 10 years. They brave the sticky jungle heat to work alongside students and community members to enhance Ak’ Tenamit’s education programs. Engineers Without Borders USA (EWB-USA) is a nonprofit humanitarian organization established to support community-driven development programs worldwide through partnerships that design and implement sustainable engineering projects, while creating transformative experiences that enrich global perspectives and create responsible leaders. -- How has Engineers without Borders helped? Youthlinc is a Utah based 501c3 nonprofit dedicated to creating lifetime humanitarians by offering students and mentors local and international service experiences. -- How has Youthlinc helped? The Knights was formed to render financial aid to members and their families. Mutual aid and assistance are offered to sick, disabled and needy members and their families. Social and intellectual fellowship is promoted among members and their families through educational, charitable, religious, social welfare, war relief and public relief works. -- how have Knights of Columbus helped? iguanafarmGroup is a full service web development and marketing group offering custom web development, design and marketing solutions across multiple industries. They've been integral in designing and creating the Education for Change website and continues to donate their services to maintain the website and assist with online marketing. Eva Nelson generously donated her exceptional talents to create the Education for Change brand and mark.